Few artists capture today’s world with as much intimacy as Liu Xiaodong. The Beijing-based figurative painter has portrayed ordinary people in the rural corners and urban centres of his native China, including the autonomous regions of Tibet and Xinjiang, as well as around the world, from Cuba to Greenland, Iceland to Thailand. Born in 1963 in a small industrial town in north-eastern China’s Liaoning province, Liu moved to Beijing aged 17 to study painting at the Central Academy of Fine Art, where he is now a professor. Earlier this year at London’s Lisson Gallery, he showed paintings from the Weight of Insomnia series, made by a robotic arm programmed to reproduce live-streamed images from surveillance cameras in locations such as Trafalgar Square and Gwangju’s May 18 Democracy Square, the site of the 1980 uprising against the South Korean military government. They are a conceptual and stylistic departure from the paintings by Liu’s own hand, which capture farmers and factory workers, prostitutes and art collectors with the same sympathetic gaze and bold strokes. But at the root of it all is a documentary impulse that parallels Liu’s involvement with China’s independent cinema from the early 1990s. Liu and his wife, the artist Yu Hong, played dissolute young artists in The Days (1993), the debut film of Wang Xiaoshuai, and that same year he provided art direction for Zhang Yuan’s classic Beijing Bastards. 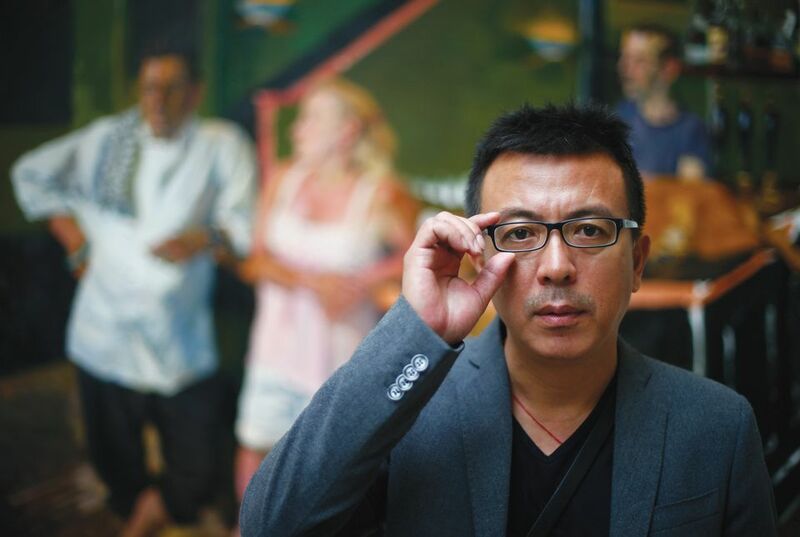 Liu has continued working with filmmakers to document his paintings and subjects around the world, making more than 20 films. His collaborations with Taiwan’s Hou Hsiao-Hsien and China’s Jia Zhangke, respectively Liu Xiaodong: Hometown Boy (2010) and Dong (2006), are being screened in the Film section of Art Basel in Hong Kong, as is Yang Bo’s documentary On the Riverbanks of Berlin (2018) about Liu’s works made in the city last year. 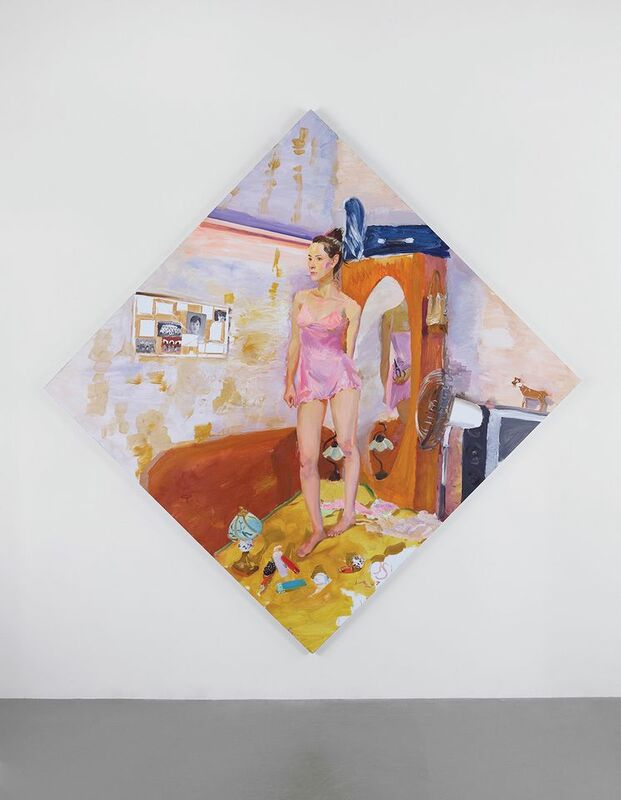 Liu Xiaodong: Eslite Gallery has a small solo show with one big painting from 2014 of a rich Indonesian couple. Plus some small recent still-lifes of fruit and vegetables around me, and portraits of my family—my wife and child. Lisson also has another painting from 2007. [The fair] is also showing a new film I did with a young director, Yang Bo, in Berlin. In 2018, I did a project painting two people, one gay and one transgender, which he documented, called On the Other Riverbanks of Berlin. It is about these two people, their lives and art, and being gay or transgender in Berlin. How did you meet these subjects? What drew you to the LGBTQ theme? [The German transgender artist and actress] Sasha [Maria von Halbach] and the young Hong Kong artist Zhuang Wei are very interesting people. They were introduced to me by Heinz-Norbert Jocks, my Berlin curator friend. I was there doing a big show, Slow Homecoming, at the Kunsthalle and NRW-Forum in Düsseldorf, and I wanted to paint something with a connection to the city and to work with the local spirit. I don’t really think about the political context. I try to look at local cultures, but not as a tourist. It is a way to understand each place’s local life, a way to enter its society. What are your impressions of Hong Kong? How do you approach the rural-urban divide? It is hard to find my way in Hong Kong. It is chaotic and everything is vertical. It makes me dizzy as a northerner. You can’t see anything, just buildings. I was born in a small village, so I am very familiar with country life. I encountered city culture much later, after the age of 17, so it is more mysterious. To me, both are of equal value, though of course they have differences—country people are more tanned, city people are paler. Country people have more time to chat with me and share their ideas when I paint them. So I paint rural people more. Urbanites in China have such a fast pace and deal with so much change. How do you prepare for your sitters? Sometimes it is very easy to understand people’s lives. And some things you can’t use language to communicate. Often I have local friends introduce me to people and help me out. Locals can talk to each other easily, so I don’t need to talk a lot. Ultimately, I’m not a novelist; I don’t need language or stories to build my impression. Painting is comparatively simple. Your diaries are often exhibited along with your paintings. What role do they play in your preparation and process? I go to a new place for one or two months, and before I sleep at night, I record all my thoughts in diaries. Otherwise, once passed, I will forget about what I see or the small experiences. Using words to say something provides an extra angle. All of this is supplementary to the painting. You have said that some Chinese artists’ studio operations are palatial compared to yours. Can you describe your studio in Beijing and your travelling studio? My studio is very simple—just over 50 sq. m, plus a storage area of 60 sq. m for completed work. Painting is very simple—it just needs four blank walls. I have two assistants: one foreigner for overseas exhibitions, an Italian guy, and a Chinese woman handling materials and administration. When I work outside, it’s simple to take an easel, palette and canvas. Overseas, it is about the same, but it’s not so easy to take an easel out in cities. I do more at homes and hotels, and work more indoors. What was the origin of your Weight of Insomnia project, which uses artificial intelligence and surveillance technology? 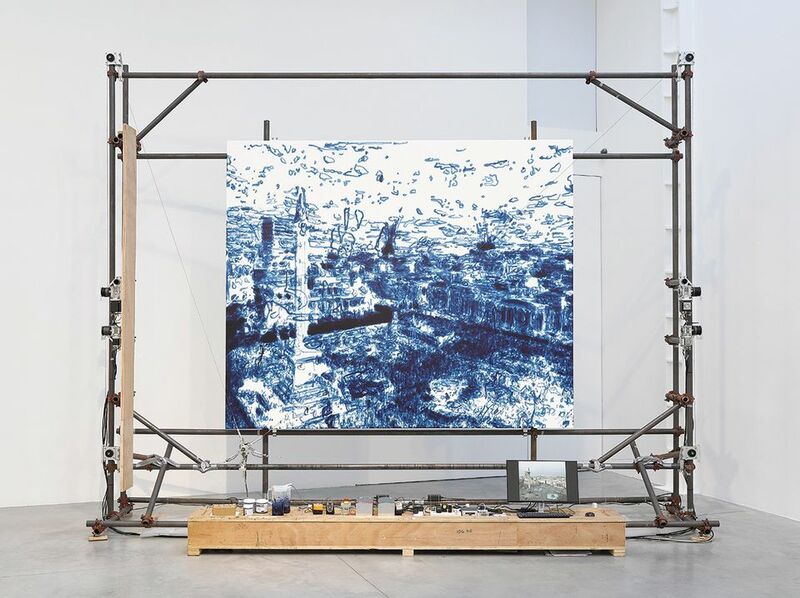 It has been going for two years, using a robotic arm to paint from images transmitted every second from a public site to the gallery or museum. When I started them I had three exhibitions already lined up—the first in Shanghai at the Chronus Art Center, China’s first non-profit multimedia space. So there I did pieces filmed in Beijing, Shanghai and my hometown. Then I had a show at Germany’s ZKM, its best multimedia art museum, and I did sites there like a BMW factory. Finally, I was showing in South Korea and did two there; then I had the show at Lisson Gallery in London and did works there finishing the project. Ultimately, I did about ten AI works. You have called time the “greatest art of all”. What did you mean by that? Time is a kind of mystery. Time is what endows a painting with aesthetic feeling and time gives people an appreciation of a painting. So time is what determines whether art is great.